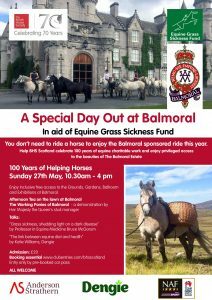 Help The British Horse Society Scotland celebrate a century of Scottish Equine Charities with Royal Approval – our much anticipated Sponsored Ride at Balmoral on May 27 sees 70 years of BHS action in improving lives for horses combine with 30 years of the Equine Grass Sickness Fund in combating this sickening disease. This joint fundraiser is open to everyone –including on your feet! For a once in a lifetime day at Balmoral Castle. Enjoy exclusive access to the grounds, afternoon tea on the lawns, demonstrations by the Balmoral stud ponies and equine talks from top vets. Bring your bike and your children and walk, run or cycle the route, enter our raffle and enjoy the bank holiday. A lovely day out to benefit Scottish horses and ponies.